Roberta Joan "Joni" Mitchell, CC (née Anderson; born November 7, 1943) is a Canadian sangster-sangwriter an penter. Rolling Stone cried her "ane o the greatest sangwriters ever", an AllMusic haes statit, "When the dust settles, Joni Mitchell mey staund as the maist important an influential female recordin airtist o the late 20t century". ↑ "JoniMitchell.com – Biography: 1943–1963 Childhood Days". 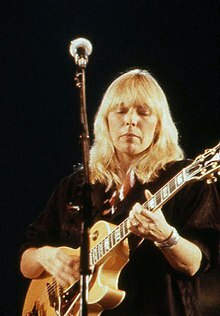 Jonimitchell.com. Retrieved November 26, 2014. ↑ Wild, David (October 31, 2002). "Joni Mitchell" (reprint). Rolling Stone. Retrieved March 9, 2007. ↑ "Joni Mitchell Biography". allmusic. Archived frae the oreeginal on April 24, 2011. This page wis last eeditit on 4 Juin 2017, at 07:20.